The Hemp (Cannabis sativa L 1753) is a species subdivided by some Authors in Cannabis sativa L., Cannabis indica Lam. 1785 and Cannabis ruderalis Janisch. After other Authors, it is one only species including varieties or subspecies. The name of the genus Cannabis comes from the Greek κάνναβις (kánnabis) hemp, word probably of Middle Eastern origin (see the Persian kanab); the name of the species sativa from the Latin “sativus”, which means cultivated and comes from the verb “sero” (to sow, to plant). 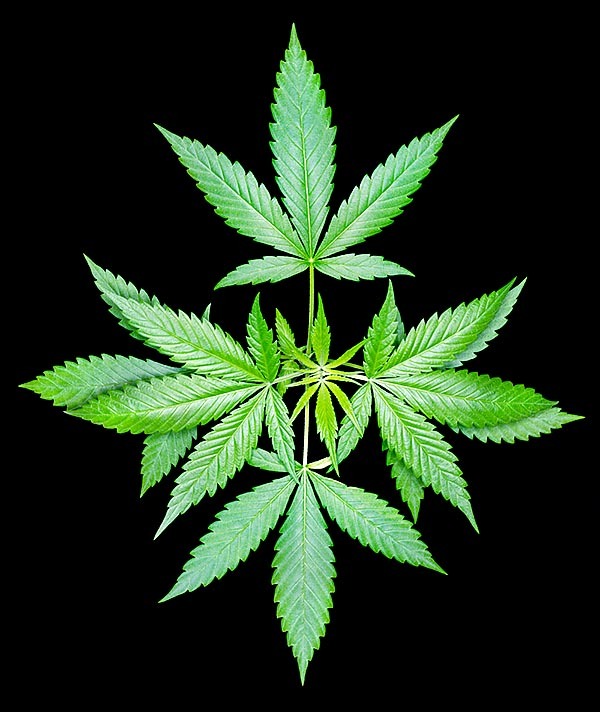 The term marijuana, of Mexican origin (originally, Marihuana), indicates the dried female inflorescences of the Cannabis utilized for voluptuous purpose. Under the name hashish is indicated the product obtained with various techniques from the processing of the Cannabis , which concentrates its active principles. The term comes from an Arabic word meaning “grass” and after some should be linked to the word “assassins”, which should have indicated the followers of an Ismaili chief of the sect of the Nizaris. The famous “Old man of the Mountain”, Hasan -i Sabbāh, around the AD 1000, from his fortress of Alamout (which means the eagle’s nest), in present Iran, was despatching his assassins who, under the effect of the drug, did kill the opponents. After the tradition, the Old man of the Mountain did inebriate with the Hashish his followers and rendered them drug addicts thus ensuring their fidelity. After others, among which the Lebanese writer Amin Malouf, this interpretation should be false as the term did indicate the followers of the “assass” (base), that is, the followers of the base of the faith and not criminals. The Alamut fortress should have been, after the tradition, impregnable, but the Mongolian chief Hulagu did conquer and destroyed it at the first attempt. 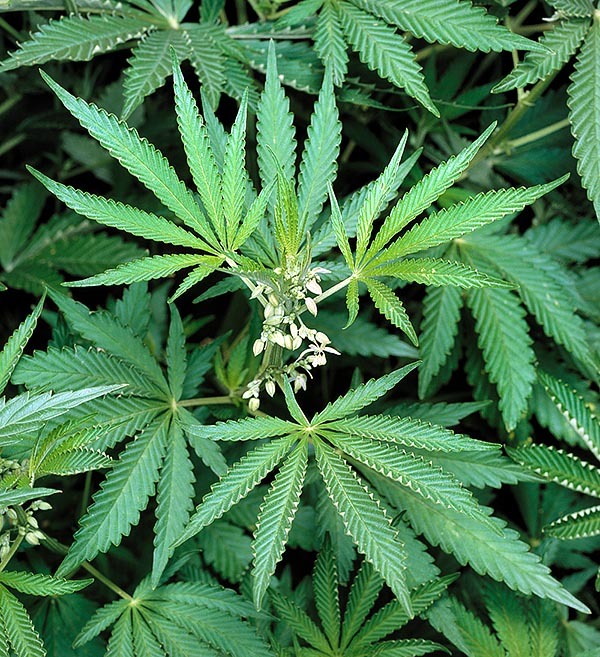 The Cannabis sativa is an annual dioecious plant with erect stems up to three or more meters tall (up to 7 in some varieties), poorly ramified, with green-grey hairs. The lower leaves are opposite, the upper ones are alternate palmate, with 5-11 acuminate segments, carried by long petioles with basal stipules, margins thickly toothed, darker on the upper page. The flowers are small, generally unisexual, yellow-greenish, united in panicles. The fruit is small, grey-brown. It blooms in summer and fructifies late summer or in autumn. The flowers have glandular hairs secreting resinous substances rich of psychoactive substances. The male inflorescences, developing on the foliar axil are panicles formed by numerous racemes. The female inflorescences, more compact than the male ones, are apical. The pollination is anemophilous. The main morphological differences between Cannabis sativa and Cannabis indica consist in the fact that Cannabis indica is less tall, is more conical and more ramified and that the leaves are broader. Moreover, the ripe leaves have at times a reddish shade. From a pharmacological point of view Cannabis indica has a greater content in psychoactive substances and in particular of Cannabidiol (CBD) rather than of delta-9 tetrahydrocannabinol (∆9 THC). The hemp grows spontaneously in Asia (Iran, northern India, and southern Siberia). It is a species much adaptable to the different climate and soil conditions. The plants for the production of textile fibre prefer temperate climates, whilst the drug ones are more suitable for warm climates. It is amply cultivated for the textile fibres since remote times especially in Europe and Asia. For getting the fibres, the plants, harvested by mowing or weeding, after drying on the field, are submitted to putrid maceration in water, usually for about one week (the maceration produces a very strong unpleasant odour and very characteristic, which in the past years impregnated the air of the countries where the hemp was cultivated). After drying, they proceeded, once manually, to “mangle” the stems for separating the long fibres from the woody part. The cultivation for textile use, for cordages and for the fabrication of paper increase until the mid-nineteenth century thanks to the extremely high productivity per hectare (the Soviet Union and Italy, especially Piedmont and Romagna, were the largest producers). In addition to the textile use, in Italy the hemp was in the past much utilized in the boating industry, for the production of cordages and sails. The abandon of the cultivation started in the fifties, due to the concurrence of other natural fibres, like the sisal, cotton and jute or synthetic fibres, as well as for the campaigns against the hemp for drug, culminated with the prohibitionism. As a matter of fact, the UN imposed the destruction of the fields cultivated with Cannnabis indica, thus seriously affecting the cultivation of the Cannabis sativa, due to the difficulty in recognizing the two forms. In Italy the laws were tightened starting from 1975, forbidding, with a short-sighted policy, the cultivation of any type of hemp. During the most recent years we are witnessing a resumption of the cultivation, utilizing varieties with low content of drug, thanks also to the support of the European Community and, mainly, to an incentive to a revision of restrictive laws. Besides for the production of textile fibres and for the pharmacological properties, the Cannabis is cultivated for the production of hemp seed oil (or hemp oil). The oil is gotten from the cold pressing of the seeds and utilized as fuel, as solvent for paints or for nutritional purposes. From a nutritional point of view, the oil is rich of essential fat acids omega 3 and omega 6, is rich of vitamins and of antioxidants and has a remarkable anti-inflammatory action. From an organoleptic point of view, it has pleasant smell and taste and can be used in lieu of other vegetal oils. The content of psychoactive cannabinoids is negligible. The Cannabis is endowed of many and powerful pharmacological actions. The most important active principles are the cannabinoids, a numerous group of substances, among which we remind especially the tetrahydrocannabinol (trans-delta9-tetrahydrocannabinol or THC), and the cannabidiol (CBD). The cannabidiol has effects partially antagonist to those of the THC. The Cannabis is utilized as medicine as well as psychoactive substance for voluptuary purpose. In order to be able to discuss about the mechanism of action of the cannabinoids and to understand the history of its discovery, a short introduction concerning the mechanism of the drugs active on the nervous system is necessary. In most cases these drugs act on the transmission of the nerve signals between one neuron and another one, connecting to the receptors which normally are stimulated by the neurotransmitters. The drug, therefore, stimulates or inhibits the transmission of the nerve signals. In this way acts, for instance, the atropine, binding to the receptors for the acetylcholine and inhibiting their function (some drugs, like the cocaine, act with a slightly different mechanism). In the case of the cannabinoids the action mechanism remained unknown since when they have discovered that they bind to a new type of receptor, specific for the cannabinoids. But what use for our brain can have a receptor binding to a foreign substance? More recently it has been actually found that a substance does exist, produced by our nervous system, capable to bind to the receptors of the cannabinoids, thus representing their physiological activator. This substance has been christened Anandamide, from the Sanskrit “ananda” which means beatitude and “amide”, the name of a chemical name. (Ananda was one of the most important disciples of the Buddha). This history closely recalls that, a little more complex and a few years older, of the opium and its derivates. Also these substances act binding to a specific receptor, called opioid receptors, whose physiologic activator was unknown till when they discovered that our organism produces “endogenous opioids”, like, for instance, the enkaphalins and the endorphins, chemical different from the morphine, but capable to bind to the receptors. The most recent surprise is that our organism is also capable to produce the real and true morphine! For the cannabinoids there are two types of receptors, CB1 and CB2. The first is amply diffused in the central nervous system and its stimulation is responsible for the psycho-activity. Conversely, the second one is mainly present in the cells of the immune system and is considered responsible of the anti-inflammatory and immunomodulatory activities of the cannabinoids. The stimulation of the CB1 receptors of the cannabinoids causes an inhibition in the release of the neurotransmitters by the neurons and inhibits consequently the transmission of the nervous stimuli from one neuron to another. The great diffusion of the CB1 receptors in the central nervous system helps in explaining the ample range of actions of the cannabinoids. The stimulation of the CB2 receptors causes, on the contrary, an inhibition of the secretion of pro-inflammatory substances by the cells of the immune system. In the Cannabis, besides the cannabinoids, is present in high quantity a substance, the beta-caryophyllene, which appears to act only on the CB2 receptor and therefore performs essentially an anti-inflammatory action. The research in the agronomic field tends to the production of varieties with low content of drugs for the textile uses and of varieties with different concentrations of tetrahydrocannabinol, of cannabidiol or of beta-caryophyllene for the various pharmacological applications. The cannabinoid receptors and the endogenous cannabinoids have appeared very early in the evolutionary history, being proved their presence already in the coelenterates (Hydra). The medical properties were already known in the ancient Egypt and in China. It seems that plants with high content of psycho-active substances were cultivated in India since the 900 BC. In the Middle Ages the Cannabis has been imported in North Africa and cultivated for the production of drug. In America, it was imported after the 1500 and the psychotropic use spread in Mexico, where it was named marijuana, and from where it reached the USA. In the old world the medicinal use of the Cannabis was much diffused, in China it was considered as one of the most important plants and indicated for the treatment of the gout and the rheumatisms. In the ancient Egypt it was utilized, inter alia, for treating the piles, whilst in the Islamic world it was used as diuretic, ant-inflammatory, analgesic and antipyretic. The modern medicine utilizes the Cannabis or its derivates for treating various pathologies and other possible applications are under study. Among the main applications, we recall the treating, very utilized and of high effectiveness, of the inappetence due to chemotherapeutic medicines, the use against anorexia and cachexia or for mental disorders like the depression and the bipolar disorder (manic-depressive disorder), the treatment of pain, of asthma and especially that of the glaucoma, where is well proved a remarkable effect on the pressure of the ocular bulb. It’s important its use as anti-inflammatory. The Cannabis is used for the treatment of the symptoms of opioids withdrawal. Under study is the utilization for the symptomatic treatment of neurodegenerative diseases such as the Huntington’s chorea or the Parkinson’s disease. Various studies suggest, moreover, and efficiency in the treatment of some types of tumours. The traditional medicine foresees the use of the Cannabis with many indications, especially as tonic, analgesic, narcotic and antitumoural. The Cannabis and derivates are very much utilized for voluptuary purposes due to their psychoactive activity. After the World Health Organization (WHO), the Cannabis is by far the most utilized drug in the world. It is estimated that about 147 million of persons (2,5% of the world population) consumes the Cannabis (0,2% of the population consumes Cocaine and 0,2% the opioids). It should be considered that the toxicity of the cannabinoids is very low and are not reported cases of acute mortality due to overdose. The drug, in various forms, is usually assumed orally or smoked in pipes or cigarettes. If smoked, the dangerous general effects of smoking are to be kept in mind. The psychoactive action of the Cannabis is very variable from one individual to another and depends also from the way of assumption. It is extremely important to consider that the content of cannabinoids of the plants is very much variable, in base of the variety as well as the conditions of cultivation and of preparation of the samples. The effects can be euphoriant, anxiogenic, giving sensation of well-being, exhilaration, increase in the enjoyment of the recreational activities, conviviality, but also panic attacks, alteration of the time and space perception and also of the memory. The intensification of feelings may interest the pleasant as well the unpleasant ones. High dosages may aver hallucinogenic. The cognition as well as the psychomotor activities bay be altered and many studies prove alterations in the capacity of driving vehicles, with consequent increase of traffic accident. The capacity to induce dependency is less than that of caffeine, alcohol, tobacco, cocaine and heroine. The long-term harmful effects of the abuse of the Cannabis are numerous, and concern mainly the juveniles. An important aspect concerns the irreversible cognitive damages, which appear to be, on the contrary, absent in the adults. It seems that predisposed individuals may encounter an increased of the risk of psychosis. Are discussed the negative effects on the school and work performances. The consumption of Cannabis in pregnancy is associated to delay in the growth of the foetus and cognitive damages in the newborn. As the voluptuary use of the Cannabis is often associated to the alcohol abuse, in many cases it is difficult to distinguish the effects of the two substances. The hypothesis that the use of Cannabis may lead to the use of other drugs like cocaine or opioids has no pharmacological support. It is clear in any case the situation of prohibitionism existing in many countries leads unavoidably the users to get in touch with the world of the criminality and the pushers may have interest in pushing the buyers to consume “heavier” drugs capable to easily cause dependency. A plant strongly psychoactive like the Cannabis has been and still is utilized in the magic and religious practices by many peoples since the most ancient past. The Vedas, more than 3500 years ago, included it amongst the most sacred plants and in the Asian Shamanism the drug was used for reaching the ecstasy that allowed the contact with the god. Greek historians like Herodotus refer that the Scythians, population of Central Asia, used to inhale during the ceremonies the smokes obtained by throwing in the fire the seeds of the Cannabis. After the old Germans, the female flowers were sacred to the goddess Freya and the Celts made a sacred use of the drug. In most recent times the followers of the “Rastas” (Rastafari) movement smoked Cannabis as a sacrament for approaching god in the ceremonies in honour of their Prophet and King, Ras Tafari Makonnen, the last Ethiopian Emperor, Haile Selassie. Also the Rasta hairstyle is inspired by Haile Selassie’s hairstyle. → To appreciate the biodiversity within the CANNABACEAE family please click here.